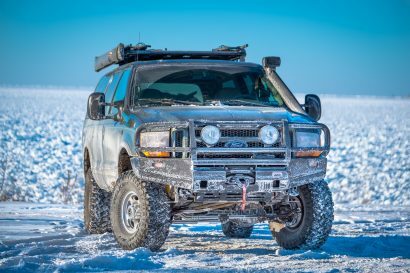 Overlanders seem to love dogs. Whether its their undying loyalty, endless spirit of adventure, or just how friggin cute they are, they’re here to stay as our travel companions. Despite how much we enjoy them though, I’d be willing to bet that few of you have ever said ” I’m sure glad I get to clean hair out of my truck for the next hour”, or “isn’t it great having dog toys and treats all over the car”. 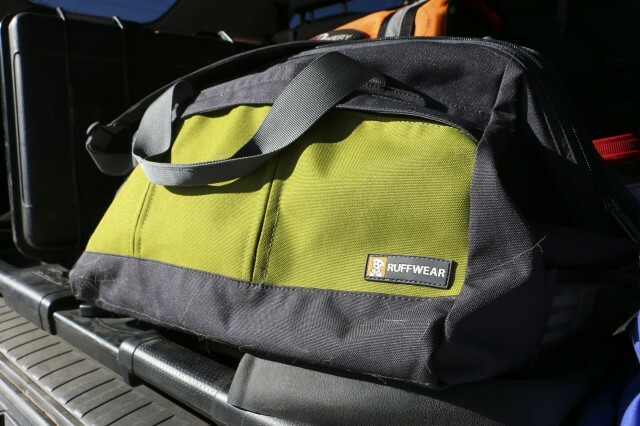 No, most of us prefer a clean vehicle, a safe dog, and secured gear, which for me, is where Ruffwear comes in. If you haven’t heard of them before, consider this outdoor dog 101. 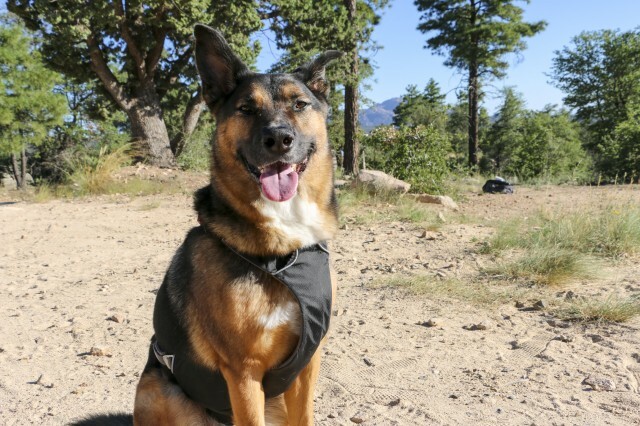 Ruffwear makes durable and effective gear for your pet, from harnesses to collapsible bowls, and even sleeping bags, they have everything and more for the adventuring critter. We’ve selected a few products we thought would be most useful to an overlander and handed them off to our dog product specialist Paxton, whose qualifications include four legs, plenty of fur, and a knack for getting things dirty. A dog wearing a seat belt had never crossed my mind, but on my way home from the office recently a Honda ran the red light in front of me and changed that. I slammed on the brakes and to my horror I watched my poor dog soar into the front seat. Though we missed the car, I dread to think where he would have gone if we hadn’t. If you have any concern for your dog in the car I can say this harness is worth the money, but for the sake of knowledge I’ve shared my other thoughts below. Ruffwear took their usual level of quality and really bumped it up a notch for this one. Lifting the Load-up to put it on our dog the harness feels sturdy and comfortable with no plastic bits or cheap mesh. Thick padding covers all the critical areas and metal hardware adorns every connection. 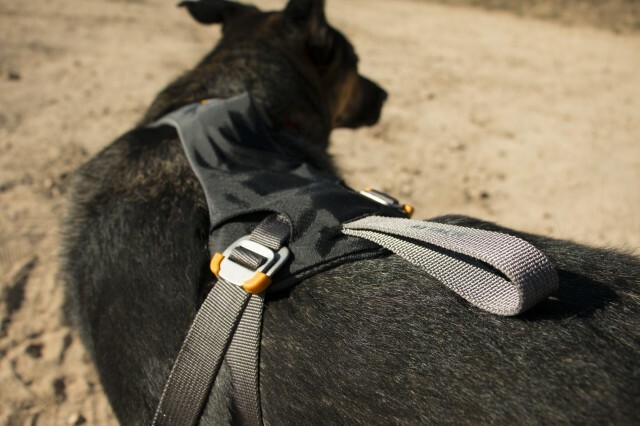 For what I can only assume is durability in a crash, Ruffwear skipped the traditional buckles and designed something entirely new. It’s an easy to use system which eliminates most failure points. Instead of making a fool of myself trying to describe it, I’ve included pictures below. I also included a picture of a fantastic feature which is so often overlooked by manufacturers, the strap tie. I can’t stand having loose straps hanging around and your dog won’t appreciate it when they snag one on a passing branch. 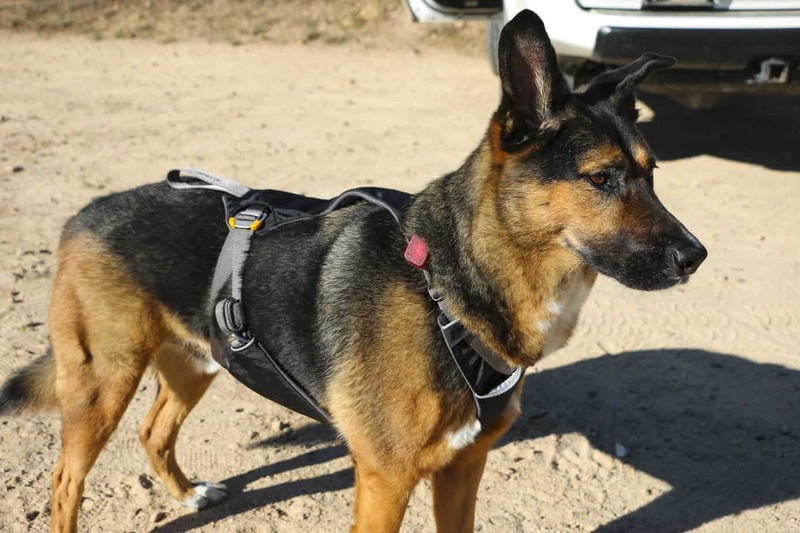 Ruffwear built their velcro system right in and it has held tight since our first test. The Load Up uses the standard car seat belt as an anchor for ease of use and optimum safety; simply pull the belt through the loop and your dog is set to go. Of course it’s one thing to claim safety, it’s another to prove it. 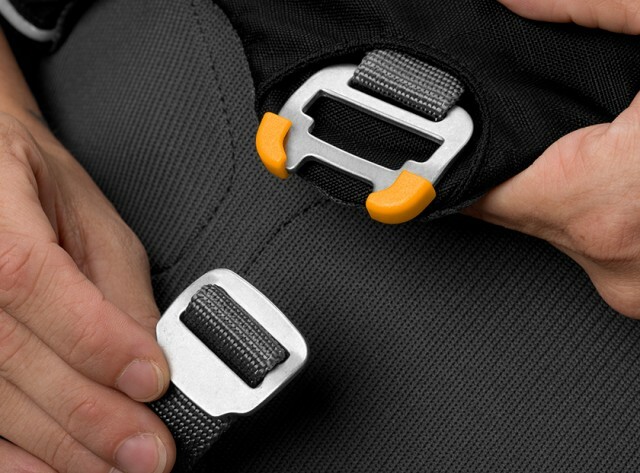 This harness system was dynamically tested at MGA Research Corp (a National Highway Traffic Safety Administration contracted test facility) under the conditions outlined in Federal Motor Vehicle Safety Standard 213 and passed. What does all that garbage mean? 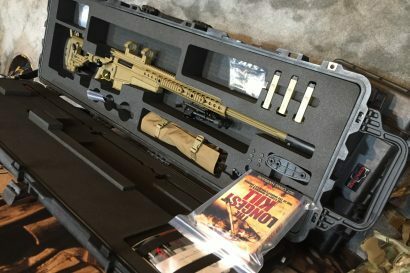 Basically it’s about as safe as dog gear gets. Although it’s really meant for use in the car and rest stops, we were curious to see how it would perform as a full time harness. During our last trip to the great white north, we used this system exclusively. On the airplane Paxton was able to maneuver and lay comfortably under the seat without any discomfort from straps or buckles. He seemed to handle long distances walking without trouble and largely didn’t even notice it was there. 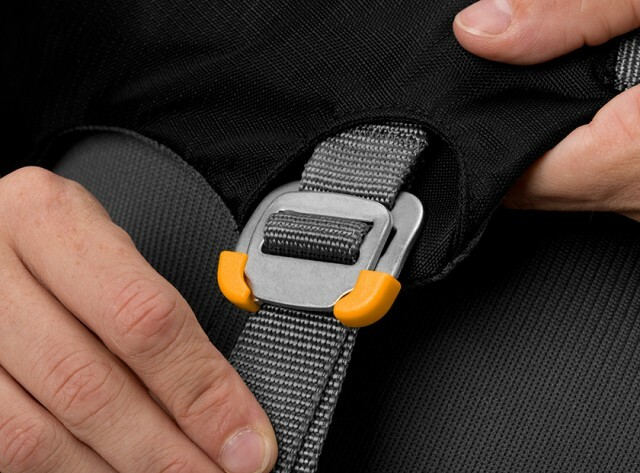 We give it another thumbs up for comfort and use-ability and a huge thumbs up for safety. There really aren’t many negatives to this product. We were overwhelmingly happy with it and only had one possible flaw throughout our testing. Despite being designed primarily for vehicle use, we felt the harness should have a front buckle or loop near the dogs head. Guiding an impatient or distracted dog by the tail end is not very effective and can cause big headaches for owners in tight quarters like cities or in our case airport security. The other “negative” is really open for interpretation and can be avoided with training or just being careful. The first time I used this harness my dog had no idea he was still connected to the seat. When I opened the door he leaped out and to his surprise was yanked back and fell down against the car with his back end in the air. He wasn’t hurt but as I’m sure you can imagine there is potential there for older or smaller dogs. 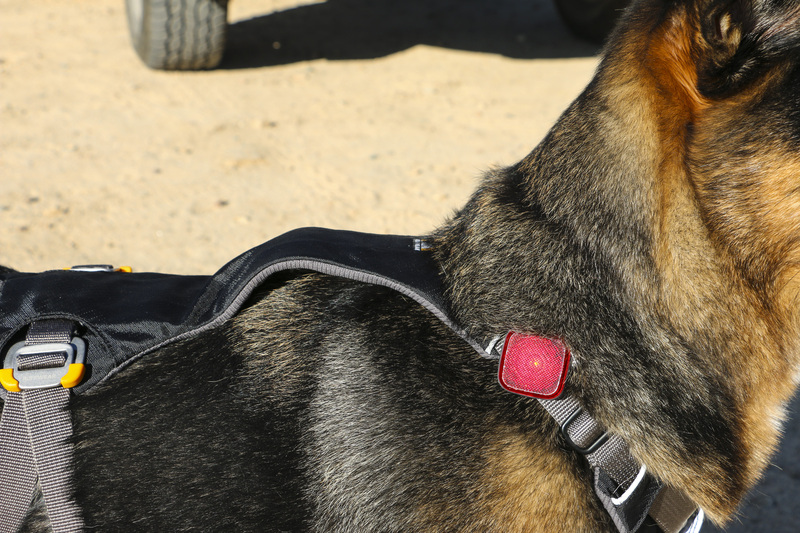 More information on the Load Up harness can be found here. 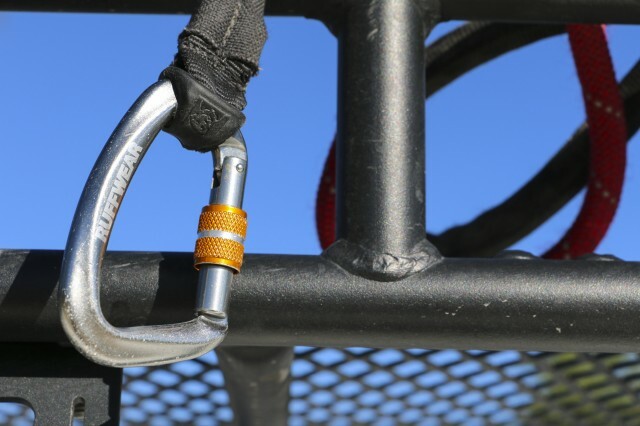 Nothing is worse than loose gear and dog toys bouncing around your truck on the trail, which is why this may be our favorite product so far. 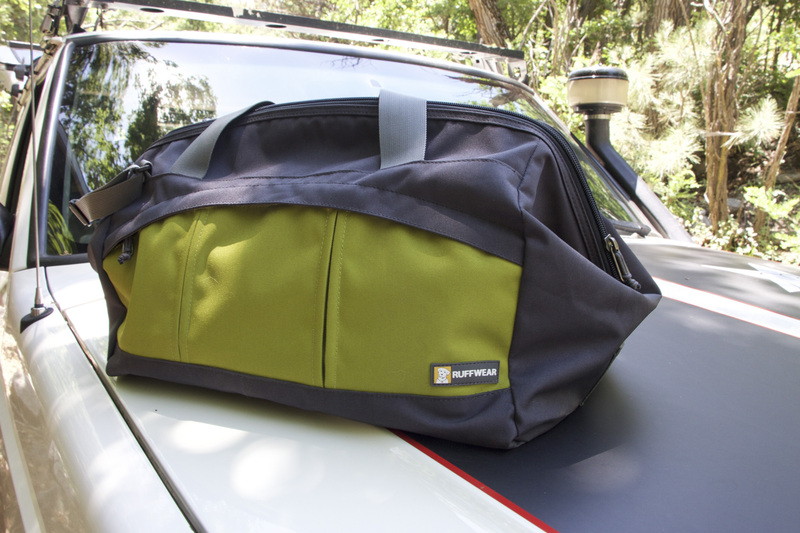 The Haul Bag is exactly what it sounds like, a dedicated bag for hauling your dogs stuff around with you. On trips only lasting a few days we found that this versatile little unit was enough to hold everything we needed including food, bowls, treats, medicine, toys, lint rollers, and more. On longer trips we simply pull out the food and the bag becomes a permanent home for everything our dog could need. 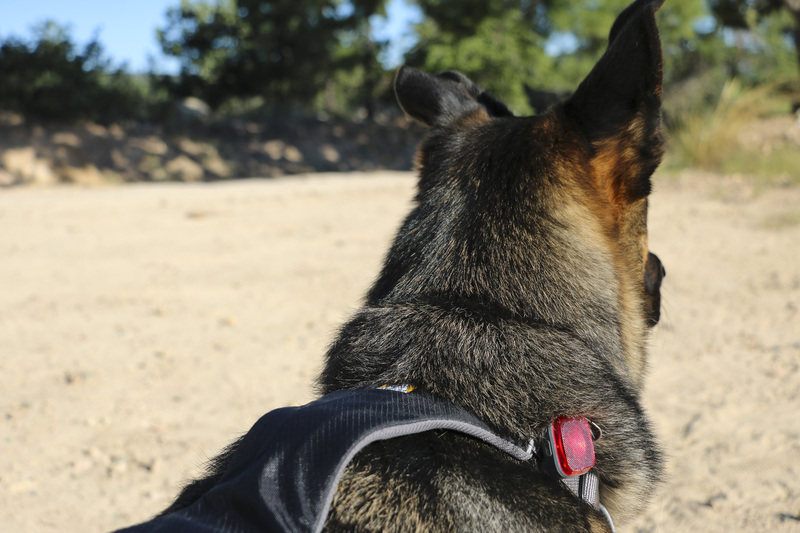 By this point you have probably figured out that quality is a consistent theme with Ruffwear. 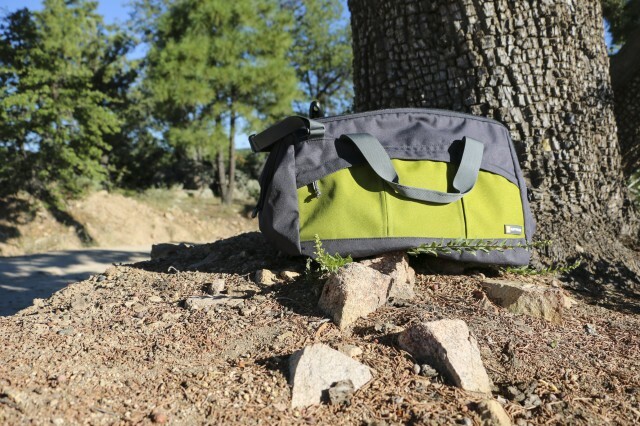 This product is no exception and feels well made with a lot of great design features, including a rather unique wide mouth top to allow full access into the bag. 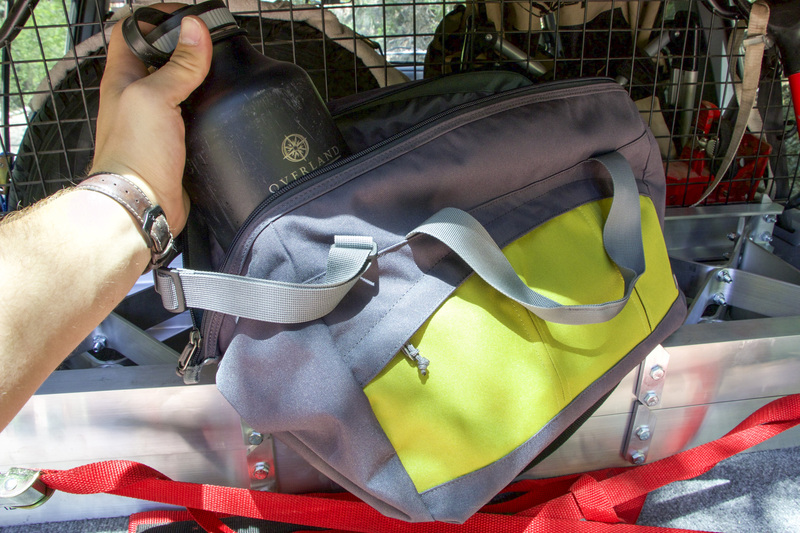 In typical overlander fashion, our favorite feature is the variety of pockets placed throughout the bag. This setup made it exceptionally easy to insert and remove all the little oddities that accompany many dogs. Everything can have its place which eliminates the endless search through the bottom of the bag for that one little treat or toy. We did not find sufficient fault with any part of this product to consider it a negative. The closest we could get was that the strap was a little flimsy, understandable with the low load requirements of such a product. More information on the Haul Bag can be found here. If there is one thing our dog does well on a trip, it’s destroy a back seat. This seemingly innocent Shepherd mix is actually a super breed developed for shedding, leaving muddy paw prints, and covering every surrounding surface in crumbs from his treats. Combine that with a black cloth interior and you can understand why a seat cover is a good idea. Based on my previous experiences with this style seat cover, I admit I was expecting to throw it away. What I found however, was a pleasant surprise. The first thing you notice when inspecting this product is the packaging, yes that’s right the packaging. Most covers in the marketplace are stored by balling or folding them up and then throwing them into the nearest corner where they proceed to unravel and get in the way of just about everything. The Dirtbag however, uses a creative design of a zipper pocket which allows the entire cover to fold into itself. The end result is a small bag that you can tuck beneath the seat when not in use. Simple storage and deployment earns a big thumbs up here. Next comes the always fun installation, which usually involves folding of seats and running around to every corner of the vehicle to tighten straps. Once again, the Dirtbag impressed. After unfolding the cover from the zipper pouch, hey did we mention how much we like the zipper pouch?, owners find a pretty straight forward process. Buckle the ends around the seats, slip the “anchors” between the seat top and seat bottom, and tighten, voila! This is certainly the easiest cover we’ve ever installed and it makes daily removal a reasonable task. 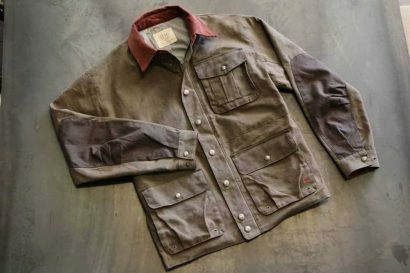 Features include waterproof fabric for those rainy days and long muddy hikes, non slip fabric to help your friend stay upright, and the ability to be machine washed in times of serious dirt. 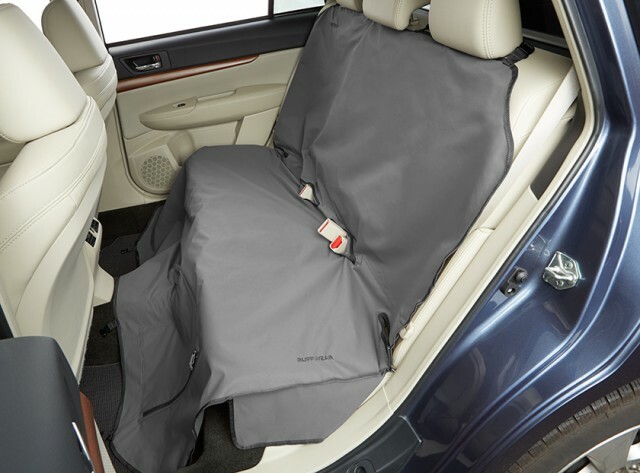 The cover also has slots for seatbelts and the ability to be set up in a hammock or bench configuration, however we don’t feel that many passengers will enjoy sitting in the mess you’re trying to keep off your seats. We do think that some sort of velcro strap running along the underside of the seat could be helpful. During extended use our Shepherd was able to shift the cover to one side exposing the seat to his utter dogstruction. While it was a quick fix, a strap running side to side would eliminate the need for adjustments all together. For more information visit Ruffwears website here. We weren’t scheduled to review the following items, but I actually purchased them myself almost a year ago and felt they deserved to be mentioned here. 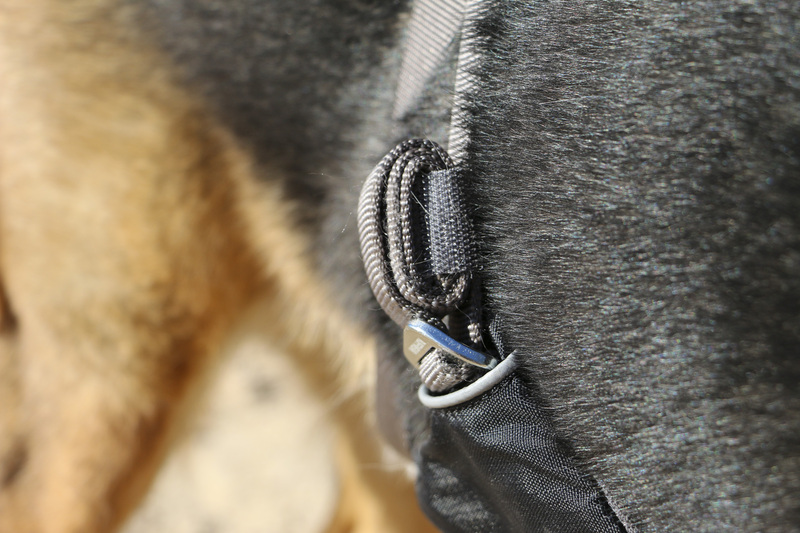 The Knot-a-leash is the first Ruffwear product I ever bought and the reason why I trust their gear now. After my dog broke his leash running for a squirrel, nearly being hit by a car, I decided I had had enough of low quality dog products. Believe it or not I have a few friends in the outdoor world and almost unanimously they pointed me to Ruffwear. Fortunately for me the local hike shack had a Knot-a-leash in stock. My first thought was that this is way better than the typical leash. 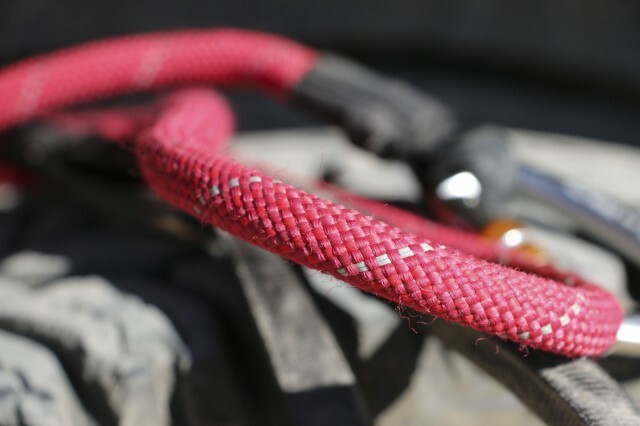 The body is made of a thick kernmantle rope laced with reflective trim for visability. It’s not exceptionally heavy, but certainly strong. 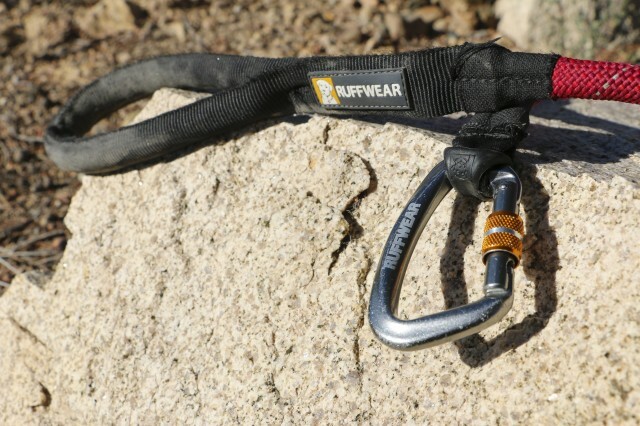 The connection end skips the goofy clips seen on nearly EVERY dog leash out there and instead uses a locking carabiner. I love this for its strength and versatility, allowing owners to use it in various situation without worry of failure. We have even used it to tie off equipment in a bad storm when our dog was inside with us. The leash took it without worry. More information on the Knot-a-leash can be found here. The second product I purchased isn’t ground breaking by any means, but just a great thing to have while camping with your dog. 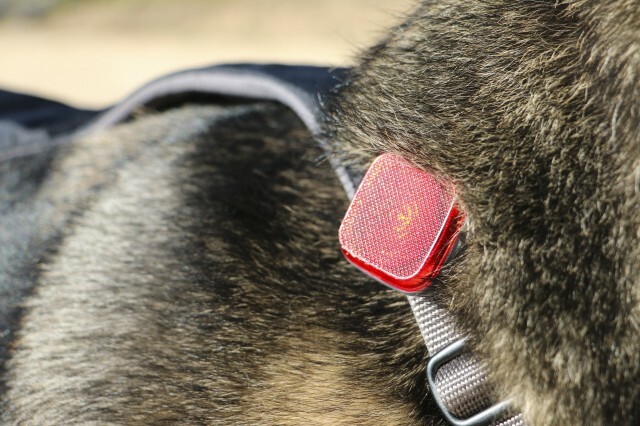 Simply dubbed “The Beacon” this lightweight watertight light clips to any of Ruffwear’s harnesses, collars, bags, life jackets, and apparel. We purchased this product to allow our dog to safely roam around at night after a long day in the car. The LED light is impressively bright and made it easy for us to keep track of him even at long distances. We haven’t had the chance to really torture test the beacon like the leash mentioned above but we’re confident that it will hold up to anything our Shepherd can put it through. More information on the beacon can be found here.